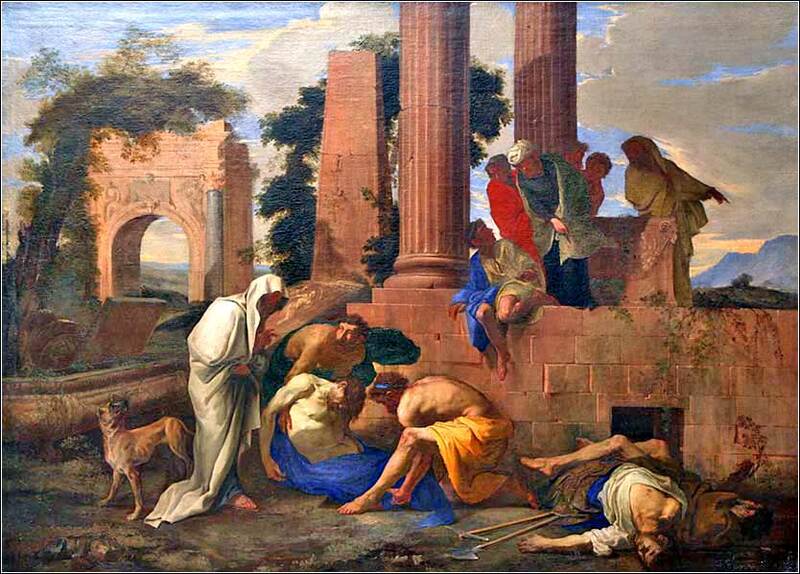 Tobit Burying the Dead by Andrea di Lione, ca. 1640. As we shall see, Tobit was a favorite subject of the 17th century masters. 232 people in our community are currently praying with you. Even though I speak not one word of Russian, I sang in the Yale Russian Chorus for two years just because I loved the music so much (it was quite a task memorizing all the words). This haunting Alleluja was part of our sacred repertory. It moves me so deeply that it is virtually proof of God's existence. Almighty God, my heavenly Father, who declares your glory and shows forth your creation in the heavens and in the earth; Deliver me, I pray, in whatever work my hand may find today, from the service of mammon; and assist me, that I may do the work which you have given me to do, in truth, in beauty, and in righteousness, with singleness of heart as your servant, and to the benefit of my fellow men; for the sake of him who came among us, humbling himself to serve all who came to him and received him, your Son, Jesus Christ our Lord. Lord, because you have made me, I owe you the whole of my love; because you have redeemed me, I owe you the whole of myself; because you have promised so much, I owe you my whole being. I pray you, Lord, make me taste by love what I taste by knowledge; let me know by love what I know by understanding. I owe you more than my whole self, but I have no more, and by myself I cannot render the whole of it to you. Draw me to you, Lord, in the fullness of your love. I am wholly yours by creation; make me all yours, too, in love. Into your hands, O Lord, Jesus Christ, my God, I commend my spirit. Bless me and all those who pray in faith of You this day; save us and grant unto us everlasting life. But then we were captured, and most of us ate the food sacrificed to Assyrian idols; but I refused, and God rewarded me for my faith by making me an official of the king, a purchasing agent. He sent me to Media at time, to buy goods, and I was able to set aside some money (which was left with my kinsman Gabael in Media.) This is how I was able to give bread to the hungry and clothing those in need. But the king died and was succeeded by Sennacherib. He did not keep the roads to Media safe and my income was cut off. But worse, the wars he fought went against him, as foreseen by the prophets, and he killed many Jews out of anger. He threw their bodies outside the walls. I would sneak out and bury them in secret; but Sennacherib caught onto me — a turncoat informed on me — and I had to go into hiding, for my life was forfeit. Thus I lost all that I had in Nineveh, and although Anna and Tobiah were safe, we were separated. Then my fortunes turned again. Sennacharib was assassinated by his own sons. The new king, Esarhaddon, appointed my nephew as to oversee all the accounts, a very high position; and he secured my return to my home, with my wife and child. By this late date in the Northern Kingdom's history, no doubt a great number of the dietary laws had been forgotten; but Tobit’s grandmother had taught him the most important one; as idolatry was the great sin of Israel, so eating food sacrificed to idols must be thought the greatest of dietary taboos. He does not speak of what this would have cost him, but at least until he gains some income, this must have meant going hungry much of the time. Sennacherib, while as wicked and bloody as many Eastern potentates, was a powerful military leader and Tobit was unlucky that he ran afoul of one of the king's few defeats, and that it was in Judea. He came back filled with hatred for the Jews. There is no motive given for his disgraceful habit of murdering Jews and throwing their bodies over the walls, to be eaten by wild animals and rot; burial was the custom of the Assyrians and a bounden duty of the Jews. To leave Jewish bodies exposed was an offense against God. Remember, in this regard, how anxious the Jews were to get Jesus into a tomb before sunset. 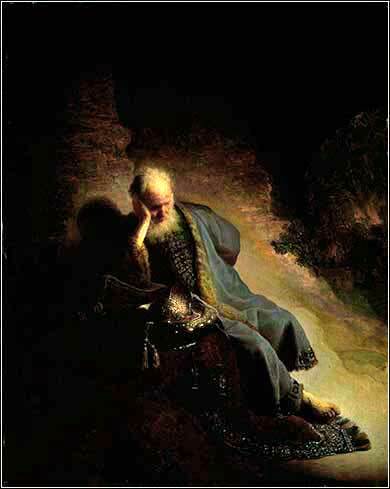 Jeremiah Lamenting the Destruction of Jerusalem, Rembrandt van Rijn ca. 1630. 2 Timothy 1:7: God has not given me a spirit of timidity, but a spirit of power, of love and of self-control.